The Canary Islands (Islas Canarias in Spanish) are a group of seven volcanic islands (with many smaller islets) located off the southern coast of Morocco. The islands have been known to Europeans since antiquity; they were inhabited by people related to the Berbers of North Africa before being conquered by Spain during the fifteenth century. They have been Spanish territory ever since. Today they are an autonomous region of Spain, divided into two provinces. The western province of Santa Cruz de Tenerife includes the islands of La Palma, El Hierro, La Gomera, and Tenerife; the eastern province of Las Palmas de Gran Canaria includes the islands of Gran Canaria, Fuerteventura, and Lanzarote. Located almost in the tropics, the islands are very popular tourist destinations. The islands are not named for canary birds; in fact, the birds (Serinus canaria) are named for the islands. 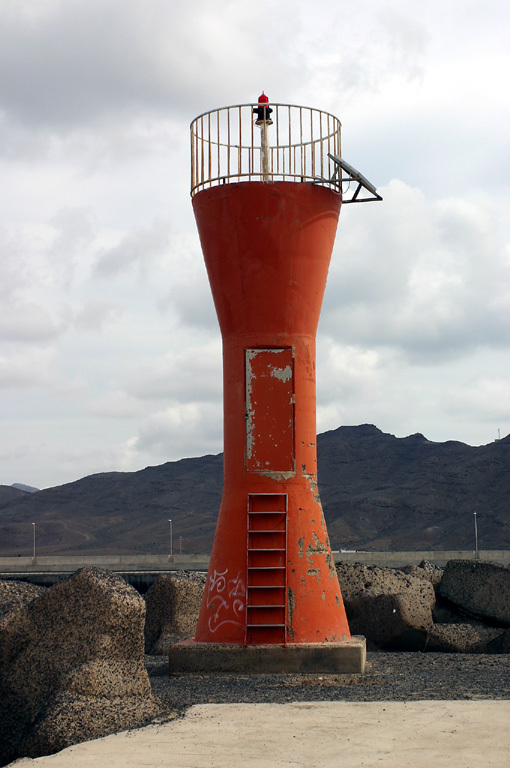 The navigational lights in Spain are the responsibility of the national port authority, Puertos del Estado, but most of them are operated and maintained by regional port authorities. In the Canaries, each of the two provinces has its own port authority. ARLHS numbers are from the ARLHS World List of Lights. ES numbers are from the Spanish national list of lights, Libro de Faros. Admiralty numbers are from volume D of the Admiralty List of Lights & Fog Signals. U.S. NGA numbers are from Publication 113. Online edition of the official Spanish light list. Photos by various photographers posted by Alexander Trabas. This page, part of Le phare à travers le monde, the web site of Alain Guyomard and Robert Carceller, links to fine photos of many lighthouses of the Canaries. Navigation chart information for the Canary Islands. 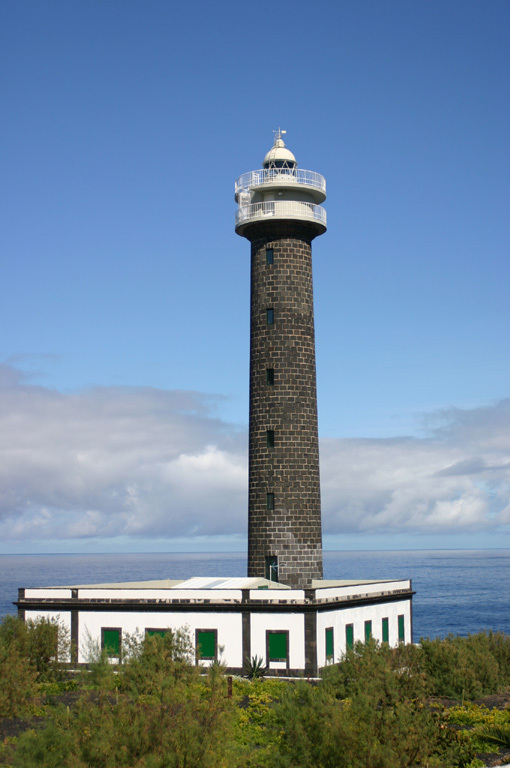 Note: Isla de la Palma is at the northwestern corner of the archipelago, about 75 km (45 mi) northwest of Tenerife. 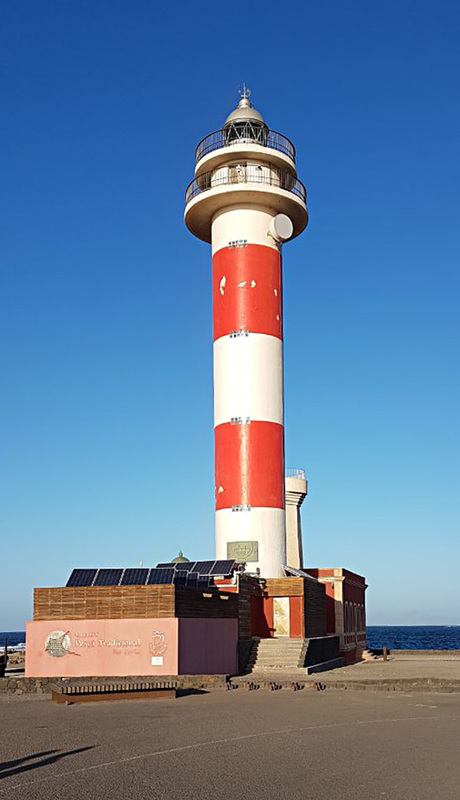 These lighthouses are operated by the Autoridad Portuaria de Santa Cruz de Tenerife. 1867. Active; focal plane 63 m (207 ft); white flash every 5 s. 34 m (112 ft) round cylindrical rubblestone tower with lantern and gallery, attached to a 1-story keeper's house. The tower is unpainted dark stone; lantern, gallery, and watch room painted white. The original 2nd order Fresnel lens is on display in the passenger terminal on the Dársena (dock) de Anaga in Santa Cruz de Tenerife. Tony Hisgett's photo is at right, Trabas has a fine photo of this lighthouse, another good photo is available, the port authority has a photo, the municipality of Barlovento (the name of the town means "windward") has a page for the lighthouse, and Google has a street view and a satellite view. 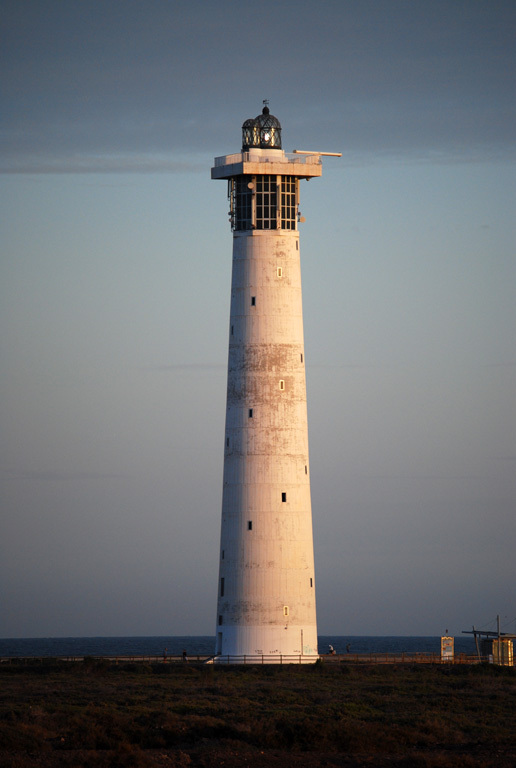 The lighthouse was restored and its height was increased by 4 m (13 ft) in 1982. In 2017 conversion of the light station for tourist accommodation was approved and in 2019 a luxury boutique hotel opened. Located at the northeastern point of the Isla de la Palma, about 5 km (3 mi) northeast of Barlovento. Site and hotel open, tower closed. 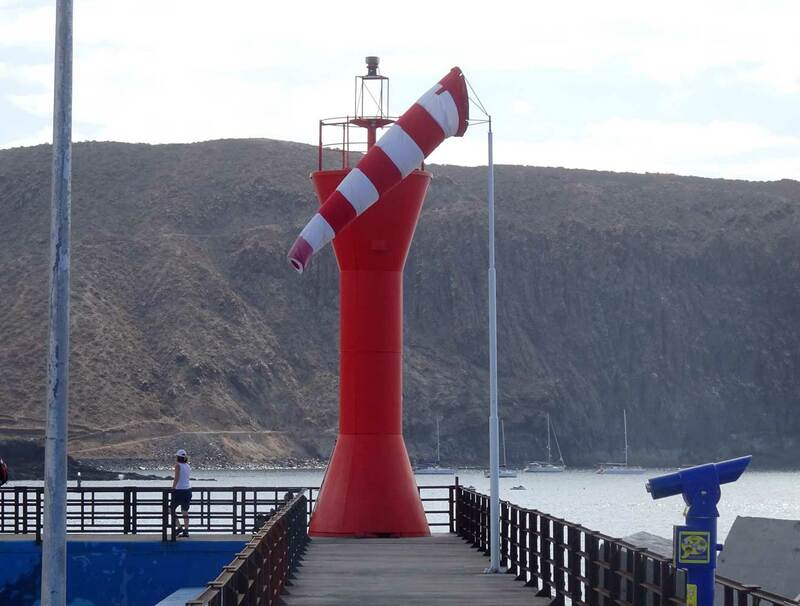 Site manager: El Faro de Punta Cumplida. ARLHS CAI-029; ES-12990; Admiralty D2846; NGA 23780. Date unknown. 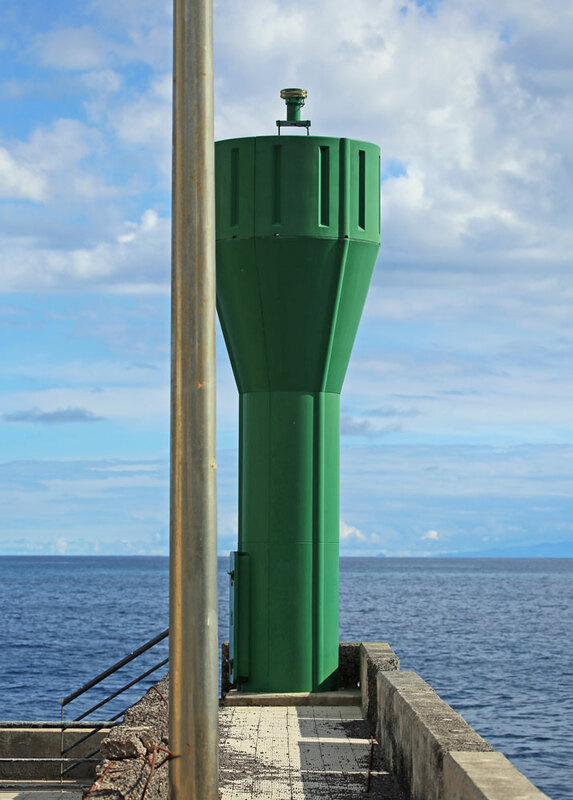 Active; focal plane 16 m (52 ft); green flash every 5 s. 8 m (26 ft) round barbell-shaped green fiberglass tower. Trabas has a photo, and Google has a satellite view and a distant street view. Located on the breakwater at Santa Cruz, on the east coast of the island. Accessible by walking the pier. Site open, tower closed. ES-13000; Admiralty D2848.45; NGA 23784. 1993. Active; focal plane 45.5 m (149 ft); white light occulting three times every 8 s. 38 m (125 ft) fluted round cylindrical white concrete tower with a rounded top; the light is displayed through a horizontal window at the top. 500 mm lens. 1-story keeper's house nearby. Trabas has a closeup photo, a 2017 photo is available, and Google has a street view and a satellite view. This is a very striking modern lighthouse. Located on the Playa de Arenas Blancas, on the southeastern coast of the island, about 8 km (5 mi) southeast of Mazo. Site open, tower closed. ARLHS CAI-002; ES-13025; Admiralty D2849.51; NGA 23798. 1903. Inactive since 1985. Approx. 12 m (40 ft) round cylindrical stone tower rising from the front of a 1-story stone keeper's house. The lighthouse was mostly rebuilt after suffering major damage in a 1939 earthquake. The original lantern was removed after deactivation. This historic lighthouse was restored around 2003 or 2004, and the present lantern was added at that time. Frank Vincentz's photo is at the top of this page, an April 2007 photo shows the restored building well, Tony Hisgett has a 2011 photo, and Google has a street view. Located adjacent to the new lighthouse (next entry). ARLHS CAI-083. 1985 (station established 1903). Active; focal plane 36 m (118 ft); three white flashes every 18 s. 24 m (79 ft) round cylindrical concrete tower with lantern and double gallery. 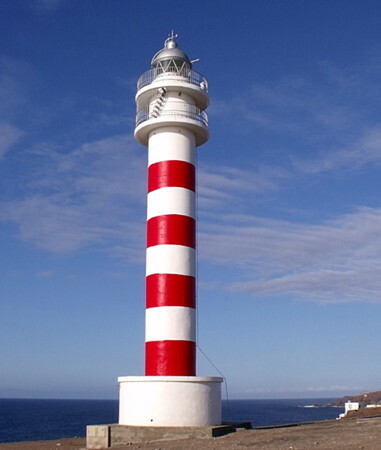 Lighthouse painted white with two horizontal red bands. Frank Vincentz's photo is at the top of this page, Marianne Perdomo has a photo, Trabas has a good photo, Lutz Hirschmann has an April 2007 closeup, and Google has a street view and a good satellite view of the station. Located at the southern tip of the island, about 13 km (8 mi) south of Los Canarios; accessible by a road with many switchbacks. Site open, tower closed. ARLHS CAI-037; ES-13030; Admiralty D2850; NGA 23800. 1993. Active; focal plane 51 m (167 ft); three white flashes, in a 1+2 pattern, every 20 s. 48 m (157 ft) octagonal white concrete tower with lantern and gallery. 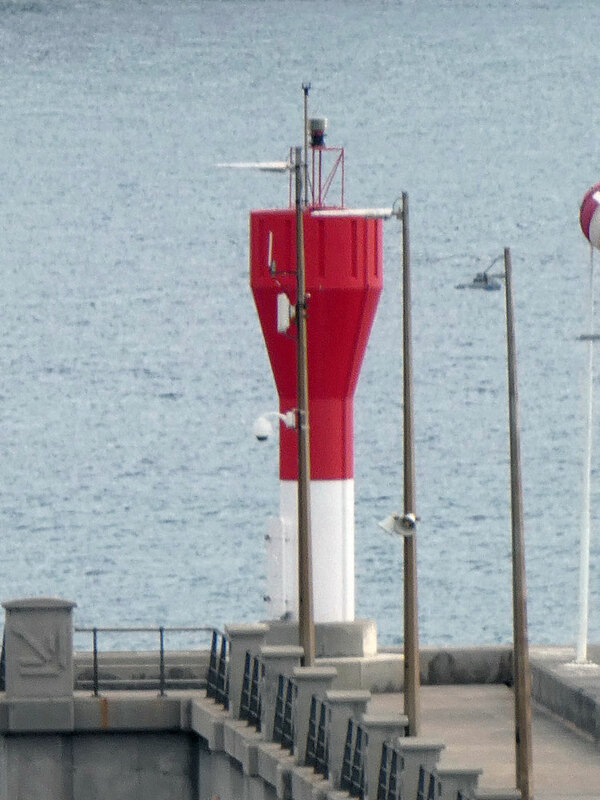 Trabas's closeup shows the remarkable modern design of this lighthouse, Michael Apel has a photo, Tamas Miklovicz has a street view from the beach, and Google has a satellite view. Located on the southwestern coast of the island, about 2 km (1.2mi) northwest of Puerto Naos. Site open, tower closed. ARLHS CAI-042; ES-13032; Admiralty D2851; NGA 23801. Note: El Hierro is the smallest of the Canary Islands and is the farthest west and south. Since this was the westernmost point of land known in classical times, Renaissance and early modern mapmakers often measured longitude eastward from the meridian of El Hierro, giving the island its alternate name "Isla del Meridiano". 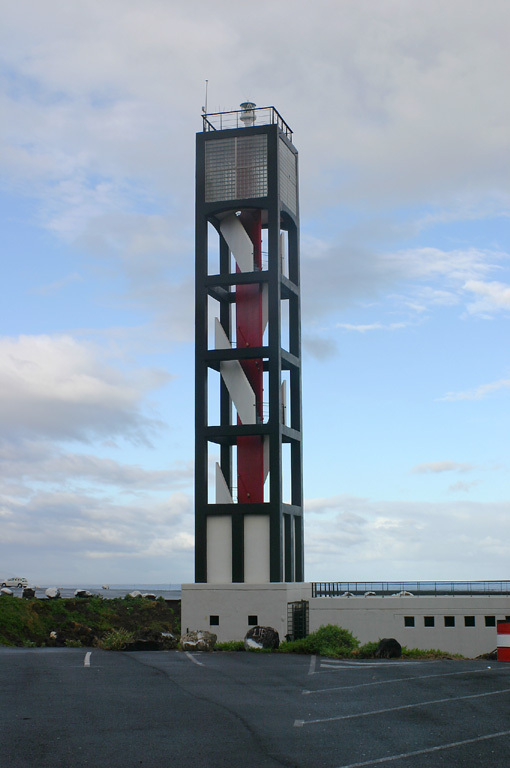 These lighthouses is operated by the Autoridad Portuaria de Santa Cruz de Tenerife. 1933. Active; focal plane 132 m (433 ft); white flash every 5 s. 25 m (82 ft) octagonal stone tower with lantern and double gallery, rising from a 2-story square stone base, attached to a 1-story U-shaped keeper's house. 1st order Fresnel lens in use. The tower is unpainted gray stone; lantern dome is gray metallic. 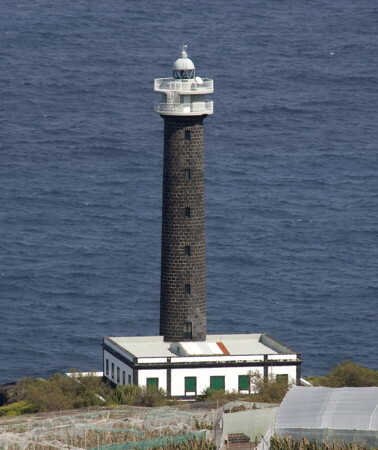 This is probably Spain's most remote lighthouse. Marcus Stöckl's photo is at right, Trabas has an excellent photo, a distant view by Rafael Gómez Carrera shows its lonely site, Guyomard and Carceller have a photo by David Moré Aguirre, José Gordillo Nogales has an excellent 2007 photo, Wikipedia has a Spanish page on the history of the station, Ronan Jameson has a street view, and Google has a satellite view. Located at the southwestern tip of the island, which was once the end of the known world for Europeans. Accessible by a 25 km (15 mi) road (at least partly unpaved) from the town of Sabinosa. Site open, tower closed. ARLHS CAI-066; ES-13060; Admiralty D2836; NGA 23808. Date unknown. 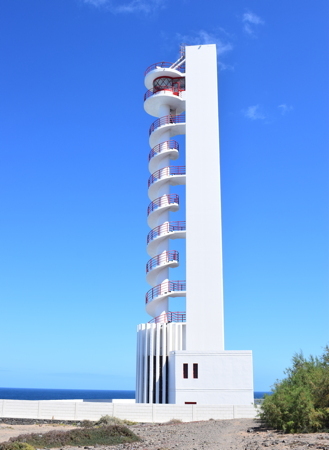 Active; focal plane 14 m (46 ft); green flash every 5 s. 7 m (23 ft) round barbell-shaped green fiberglass tower. Trabas has a photo and Google has a satellite view and a distant street view. Located on the breakwater at Puerto de la Estaca, near the northeastern tip of the island. Accessible by walking the pier. Site open, tower closed. ES-13070; Admiralty D2838; NGA 23804. Note: La Gomera, the second smallest of the islands, is located about 30 km (18 mi) off the southwestern tip of Tenerife. 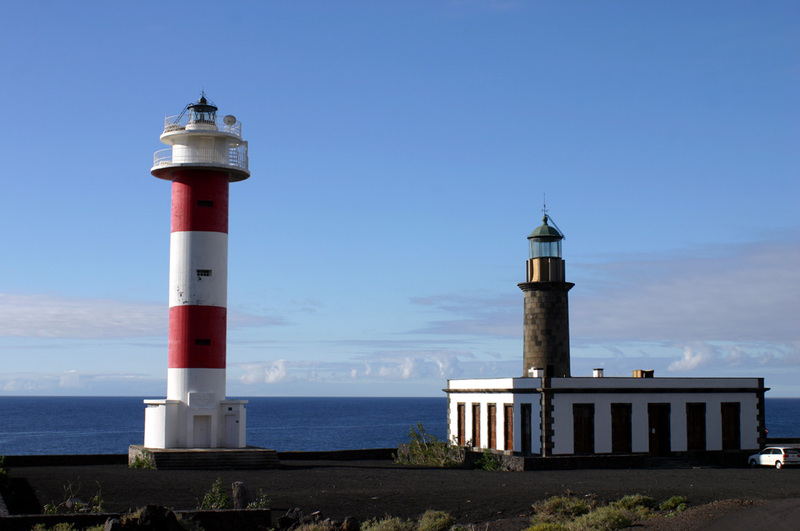 These lighthouses are operated by the Autoridad Portuaria de Santa Cruz de Tenerife. 1903. Inactive since 1978. 6 m (20 ft) round cylindrical masonry tower, attached to the front of a 1-story masonry keeper's house. Building painted white with unpainted stone trim; lantern roof is metallic green. A closeup photo is available, and Google has a street view. Located in front of the newer lighthouse (next entry). ARLHS CAI-086. 1978 (station established 1903). Active; focal plane 84 m (276 ft); two white flashes every 10 s. 15 m (49 ft) round cylindrical concrete tower with lantern and double gallery. 3rd order clamshell Fresnel lens in use. Lighthouse painted white with one horizontal red band below the galleries. Trabas has a closeup photo, Dirk Schmitt's closeup photo shows the mountains of Tenerife in the background, and Google has a street view and a satellite view of the station. 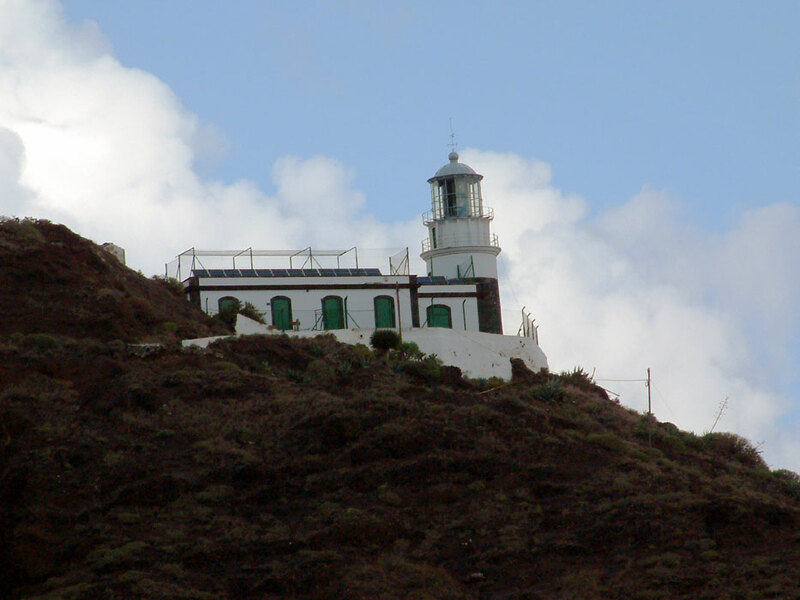 This lighthouse is a shorter version of the newer Faro de Fuencaliente on Isla de la Palma. Located atop a precipitous headland just north of San Sebastián de la Gomera, the principal town and port of the Isla de la Gomera, on the east side of the island. Site open, tower closed. ARLHS CAI-054; ES-12950; Admiralty D2842; NGA 23812. Date unknown. 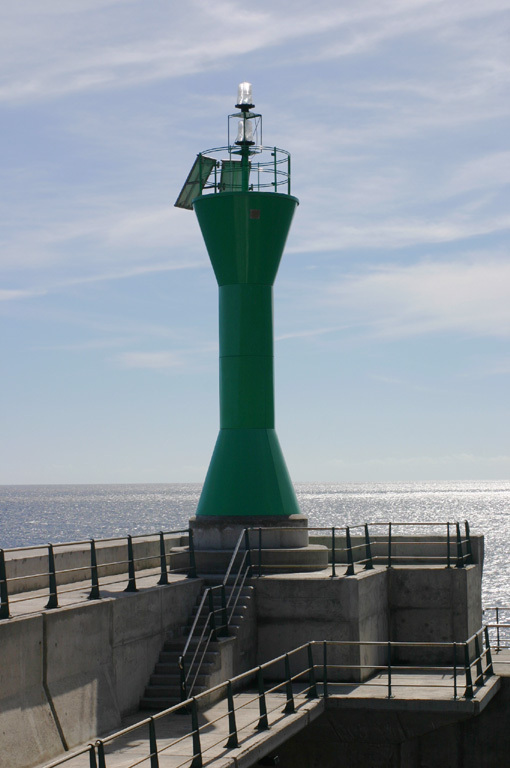 Active; focal plane 15 m (49 ft); green flash every 5 s. 7 m (23 ft) round barbell-shaped green fiberglass tower. Trabas has a photo, and Google has a satellite view and a distant street view. 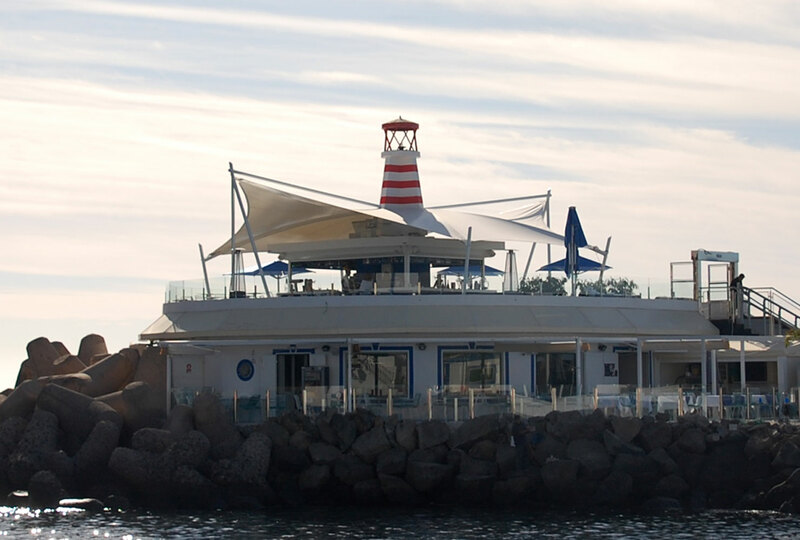 Located on the breakwater at Puerto de San Sebastián, on the east side of the island. Site and tower closed (the end of the pier is fenced). ES-12965; Admiralty D2844.7. Note: Tenerife is the largest of the Canary Islands. Its name means "white mountain," a reference to the snows that sometimes fall atop the great volcano El Teide, which rises to a height of 3718 m (12,200 ft) and is visible in clear weather from the coast of Morocco. 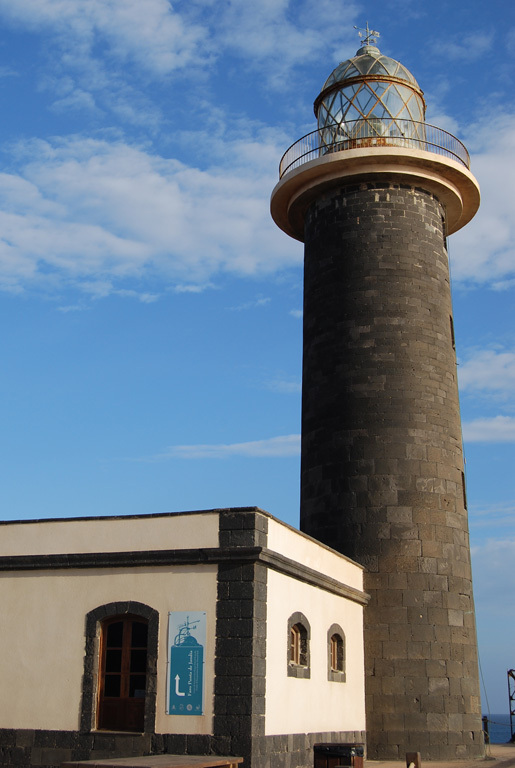 The lighthouses of Tenerife are operated by the Autoridad Portuaria de Santa Cruz de Tenerife. 1902. Inactive since 1976. 6 m (20 ft), lantern mounted directly on the roof at the front of a 1-story masonry keeper's house. Building painted white with unpainted stone trim; lantern roof is metallic green. The lantern is visible in a photo of the station by H.H. Schüller, and both lighthouses are seen in an October 2007 photo. 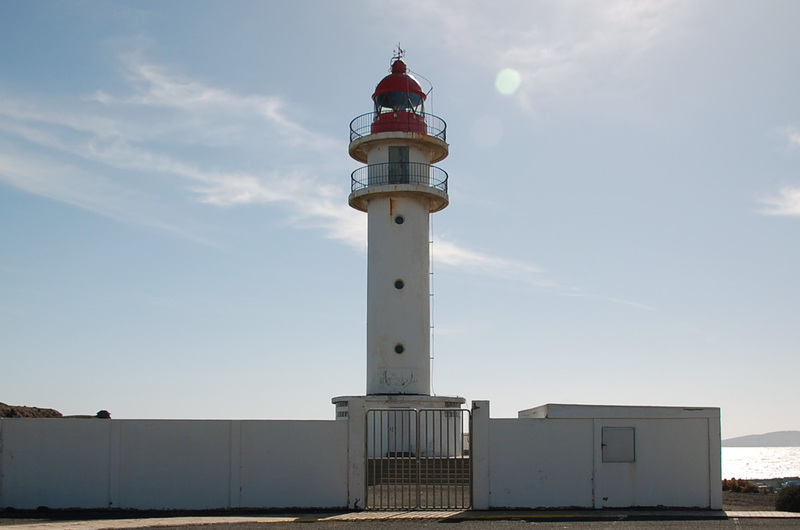 Lighthouse Digest has a photo by Xavier Leroy and reports that the building has been given to the town of Arico and is to be renovated as a restaurant school. It's clear from José Mesa's January 2009 photo and an October 2012 photo that this hasn't happened. Located beside the newer lighthouse (next entry). ARLHS CAI-081. 1976 (station established 1902). Active; focal plane 54 m (177 ft); three white flashes every 20 s. 39 m (128 ft) round cylindrical concrete tower with lantern and double gallery. Lighthouse painted white with three horizontal red bands. José Mesa's photo is at right, H.H. Schüller has a closeup photo, Guyomard and Carceller have good photos by Jean-Michel Penin, Trabas has a photo by Klaus Kern, Martin Křivda has a 2018 street view, and Google has a fine satellite view of the station. 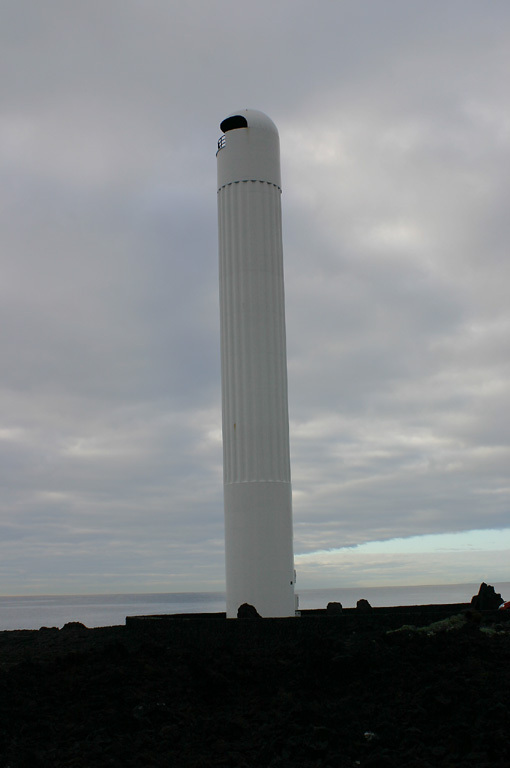 This lighthouse is a taller version of the newer Faro de Fuencaliente on Isla de la Palma. Located on the southeastern coast of Tenerife, on a point of land about 2.5 km (1.5 mi) southeast of Poris de Abona. Site open, tower closed. ARLHS CAI-022; ES-12870; Admiralty D2829; NGA 23828. 1895. Inactive since 1978. 6 m (20 ft), lantern mounted directly on the roof at the front of a 1-story masonry keeper's house. Building painted white with unpainted stone trim; lantern roof is metallic green. 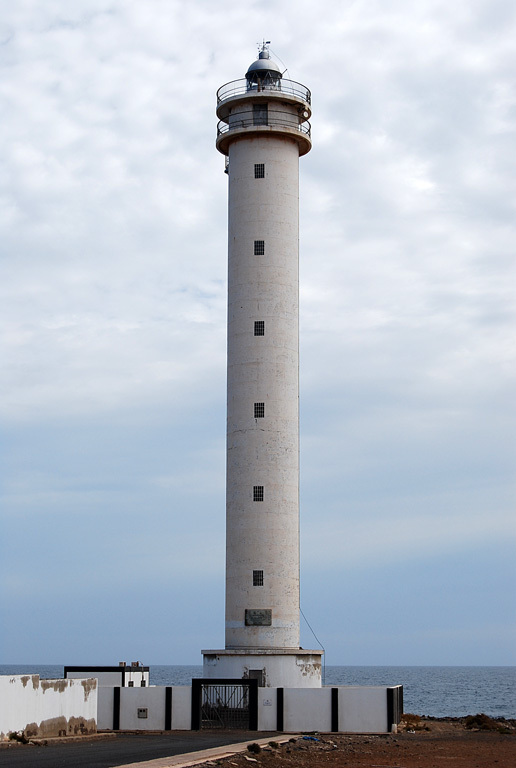 The light is seen in José Mesa's photo, and a 2012 photo of both lighthouses is available. This building is very close to the edge of the cliff; it may be endangered. Located in front of the newer lighthouse (next entry). ARLHS CAI-085. 1978 (station established 1895). Active; focal plane 51 m (167 ft); three white flashes every 12 s. 32 m (105 ft) round cylindrical concrete tower with lantern and double gallery. Lighthouse painted white with three horizontal red bands. José Mesa has a good 2007 photo, Trabas has a distant photo, and Google has a good satellite view. 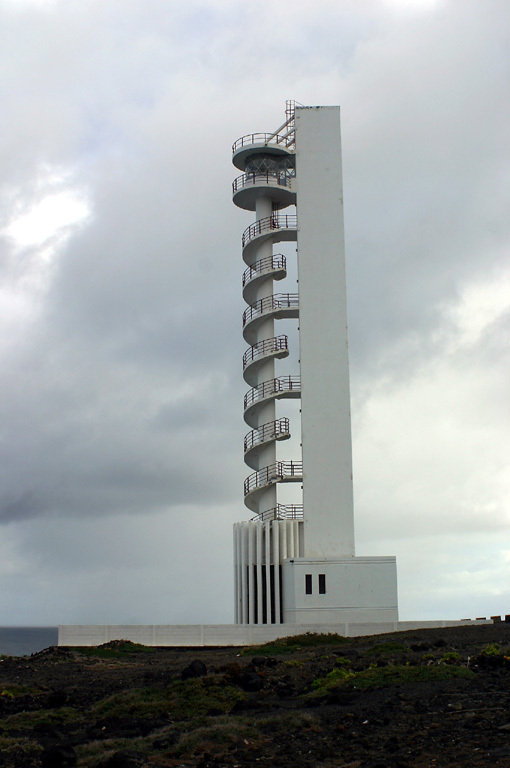 This lighthouse is a taller version of the newer Faro de Fuencaliente on Isla de la Palma. Located on the southernmost tip of Tenerife, about 15 km (9 mi) southeast of Los Cristianos. Site and tower closed. ARLHS CAI-050; ES-12890; Admiralty D2830; NGA 23832. Date unknown. Active; focal plane 13 m (43 ft); red flash every 5 s. 7 m (23 ft) round barbell-shaped red fiberglass tower. Trabas has a closeup photo, Vadim Galitsyn has a street view along the pier, and Google has an indistinct satellite view. Los Cristianos is a terminal for ferries to La Palma, El Hierro, and La Gomera. Located on the breakwater at Puerto de los Cristianos, near the southwestern tip of the island. Accessible by walking the pier. Site open, tower closed. ES-12900; Admiralty D2831; NGA 23836. 1897. Inactive since 1976. 8 m (26 ft) round cylindrical stone tower with lantern and gallery, attached to the front of a 1-story masonry keeper's house. Tower unpainted; keeper's house painted white with unpainted stone trim; lantern painted white. A 2010 photo is available, the old tower can be seen in a distant view of the site, and a 2013 photo of the lantern shows it to be in poor condition. There was a report that the building has been donated to the town of Buenavista de Norte for use as a school workshop, but no renovation for this purpose is seen. Located in front of the newer lighthouse (next entry). ARLHS CAI-084. 1976 (station established 1897). Active; focal plane 60 m (197 ft); three white flashes, in a 1+2 pattern, every 20 s. 20 m (66 ft) round cylindrical concrete tower with lantern and double gallery. Lighthouse painted white with two horizontal red bands. Trabas has a good photo, Grethe Anæus has a photo, Sergey Ananin has a street view, Wikimedia has a distant view, the Degree Confluence Project has a distant view from the sea that shows the magnificent setting of this site, and Google has a satellite view. 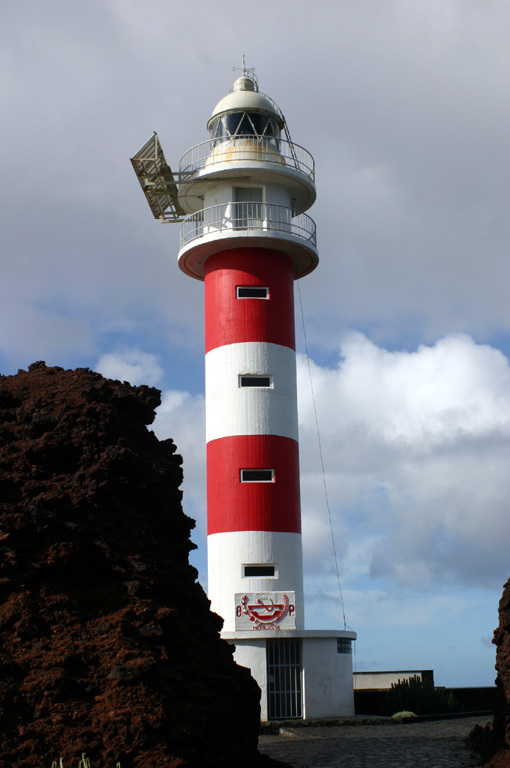 This lighthouse is another version of the newer Faro de Fuencaliente on Isla de la Palma. 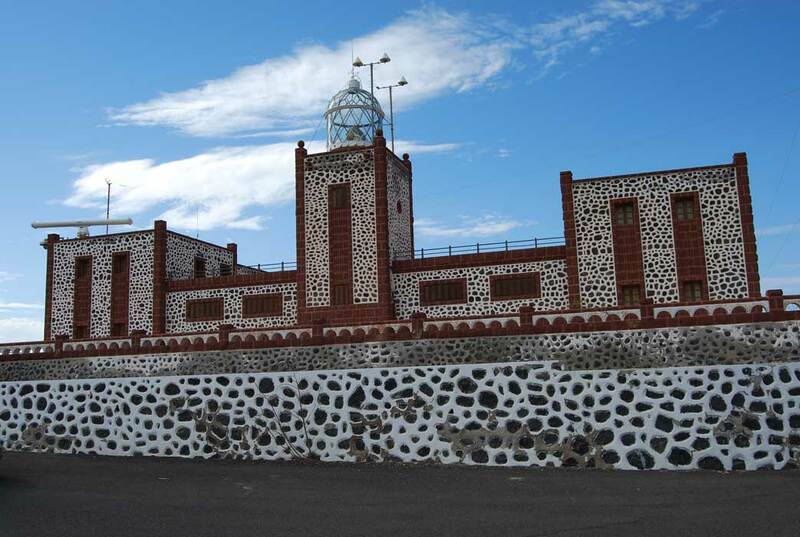 Located on the westernmost tip of Tenerife, about 11 km (7 mi) west southwest of Buenavista del Norte. Site open, tower closed. ARLHS CAI-033; ES-12920; Admiralty D2832; NGA 23840. 1997. 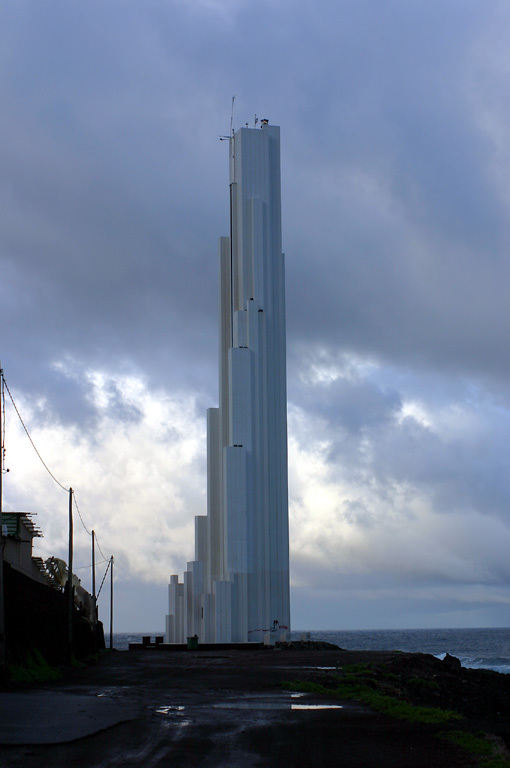 Active; focal plane 76.5 m (251 ft); four white flashes every 11 s. 40.5 m (133 ft) square cylindrical concrete tower with an external spiral staircase that winds around a column in front of the main tower. A photo is at right, another good photo of this remarkable design is available, Trabas also has an excellent photo, and Google has a street view and a satellite view. Located on a promontory about 4 km (2.5 mi) northeast of Buenavista del Norte. Site open, tower closed. ARLHS CAI-004; ES-12925; Admiralty D2831.8; NGA 23838. 1995. Active; focal plane 31 m (102 ft); two white flashes every 7 s. 27 m (89 ft) square cylindrical skeletal tower with an external stairway winding around a central column, all mounted on a 1-story equipment building; there appears to be an enclosed watch room and the light is displayed from a platform atop the tower. The lighthouse is dark brown steel with white trim. Another remarkable modern design. Trabas has a fine closeup, Wikimedia has Silvio Dellacqua's photo, another good photo is available, and Google has a street view and a satellite view. Located at a point of land on the waterfront of Puerto de la Cruz, the principal city on the north coast of Tenerife. Site open, tower closed. ARLHS CAI-020; ES-12934; Admiralty D2833; NGA 23842. 1991. Active; focal plane 52 m (171 ft); three white flashes every 16 s. 50 m (164 ft) white masonry tower, vertical at the front but stepped irregularly in the rear, giving the tower a pyramidal form; the light is displayed from a short post at the peak of the tower. An artistic, very striking design for a lighthouse. A closeup is available,Wikimedia has Klaus Peter's 2013 photo, Trabas has a photo, and Google has a street view and a satellite view. Located on the waterfront in Punta del Hidalgo, a town near the east end of the northern coast of Tenerife. Site open, tower closed. ARLHS CAI-035; ES-12945; Admiralty D2818; NGA 23854. 1864. Active; focal plane 247 m (810 ft); six white flashes, in a 2+4 pattern, every 30 s. 21 m (69 ft) round cylindrical stone tower with lantern and gallery, attached to the front of a 1-story keeper's house. Original 1st order Barbier & Fenestre Fresnel lens in use. Tower is unpainted stone; lantern, gallery and keeper's house painted white, with green trim on the house. A photo is at right, a closeup photo and a second closeup are available, Trabas has a photo by Arno Siering, Anatoly Vladimirov has a street view, and Google has a satellite view. 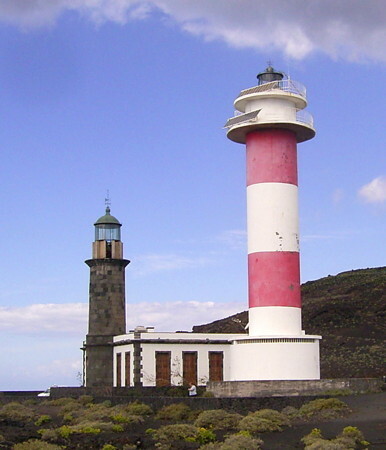 This historic lighthouse is the traditional landfall light for Tenerife. Located at the northeastern tip of the island; accessible only by a lengthy hike. Site and tower closed. ARLHS CAI-001; ES-12630; Admiralty D2820; NGA 23852. 1863. Inactive since 1954 (a decorative light is probably displayed). 6 m (20 ft) hexagonal wood tower (covered by vinyl siding?) with lantern and gallery. Tower painted white, lantern and gallery gray. C.W. Bash has a photo, a fine closeup is available, Huelse has a historic postcard view, and Google has a street view and a satellite view. The little lighthouse has been nicely restored; a 5th order (?) Fresnel lens is mounted in the lantern. Located on the waterfront of Santa Cruz de Tenerife, the provincial capital, near the ferry terminals. Site open, tower closed. ARLHS CAI-076. Date unknown. Active; focal plane 19 m (62 ft); two red flashes every 7 s. 5 m (17 ft) round tower with a flared top, painted red. Trabas has a photo and Bing has a satellite view. 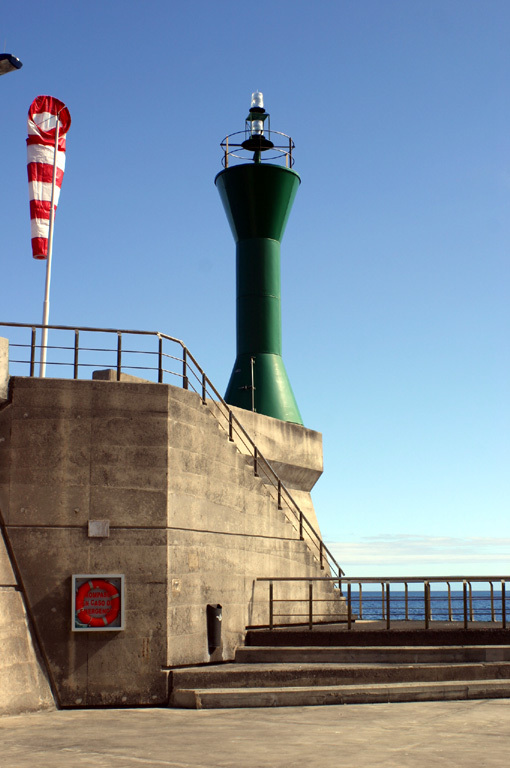 Located at the north end of the main breakwater mole of Santa Cruz de Tenerife. Site and tower closed but the light can be seen distantly from the waterfront. Site and tower closed. ES-12690; Admiralty D2822; NGA 23868. Date unknown. Active; focal plane 13 m (43 ft); three green flashes every 9 s. 6 m (20 ft) round tower with a flared top, painted green. Trabas has a photo, and Bing has a satellite view. 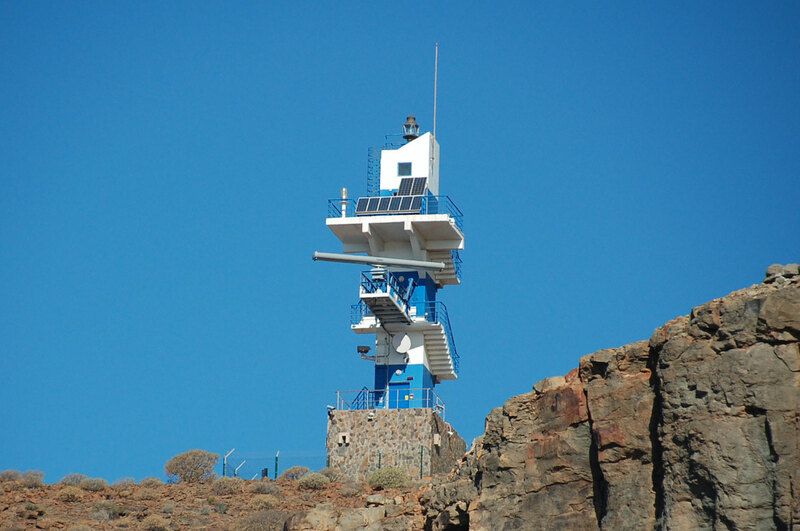 Located at the south end of the main breakwater mole of Santa Cruz de Tenerife. Site and tower closed but the light can be seen from the waterfront nearby. Site status unknown. ES-12715; Admiralty D2826.72; NGA 23912. Note: Gran Canaria, the second largest of the islands, is located in the center of the group. The island is approximately circular with a diameter of about 50 km (30 mi). 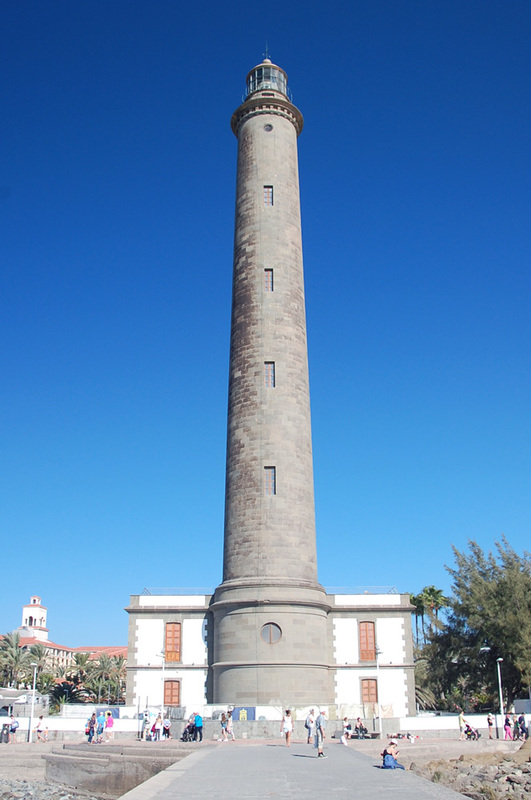 Its lighthouses are operated by the Autoridad Portuaria de Las Palmas de Gran Canaria. 1985 (station established 1891). Active; focal plane 47 m (154 ft); four white flashes every 20 s. 24 m (79 ft) round cylindrical masonry tower with lantern and double gallery. 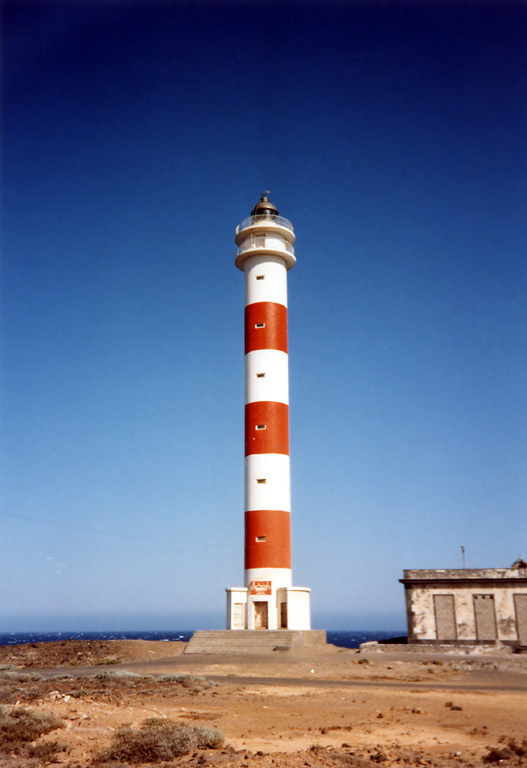 Lighthouse painted white with horizontal red bands below the galleries; lantern dome is unpainted gray metal. Toni Teror's photo is at right, Juan Francisco Marrero has a good photo, Trabas has Erich Hartmann's closeup, and Google has a street view and a satellite view. Located at the northwestern corner of the island, about 2 km (1.2 mi) northwest of the town of Sardina. Accessible by road. Site open, tower closed. ARLHS CAI-055; ES-12610; Admiralty D2816; NGA 23928. Date unknown (station established 1865). Active; focal plane 249 m (817 ft); four white flashes, in a 1+3 pattern, every 20 s. 10 m (33 ft) round cylindrical masonry tower with lantern and gallery mounted atop a 2-story keeper's house; the total height of the structure must be more than 10 m. Building painted white; gallery rail painted yellow. A 2012 closeup photo is available, Juan Manuel González has a 2013 photo, Trabas has a distant photo, Wikimedia has a view from the sea, and Google has a satellite view. La Isleta is a mountainous peninsula extending northward from the city of Las Palmas. Located atop a volcanic dome about 2.5 km (1.5 mi) north of the harbor of Las Palmas de Gran Canaria, at the northeastern corner of the island. Site status unknown; the shortage of photos suggests that this area may not be open to the public. ARLHS CAI-008; ES-12230; Admiralty D2798; NGA 23932. Date unknown. Active; focal plane 17 m (56 ft); three green flashes every 12 s. 9 m (30 ft) octagonal stone tower; dark stone alternates with painted white horizontal bands. There is a small gallery, but no lantern. Trabas has an excellent photo by Rainer Arndt, C.W. Bash also has a photo, and Google has a satellite view. 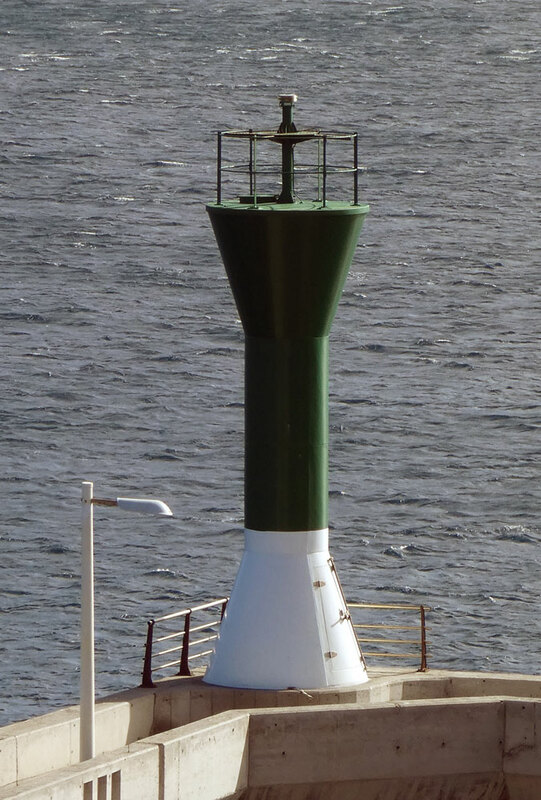 This light is on the mole at the southern end of the container ship terminal of Puerto de la Luz, the main harbor of Las Palmas de Gran Canaria. (The pier was formerly named for Generalissimo Francisco Franco, who was the governor of the Canary Islands before he became dictator of Spain.) Site status unknown. ARLHS CAI-060; ES-12300; Admiralty D2801.2; NGA 23956. 1905. Active; focal plane 33 m (108 ft); two flashes every 10 s, white or red depending on direction. 17 m (56 ft) round cylindrical masonry tower with lantern and double gallery. Entire lighthouse painted white. Trabas has a closeup photo, Jaime Hernandez Barrera has a closeup photo, and Google has a street view and a satellite view. 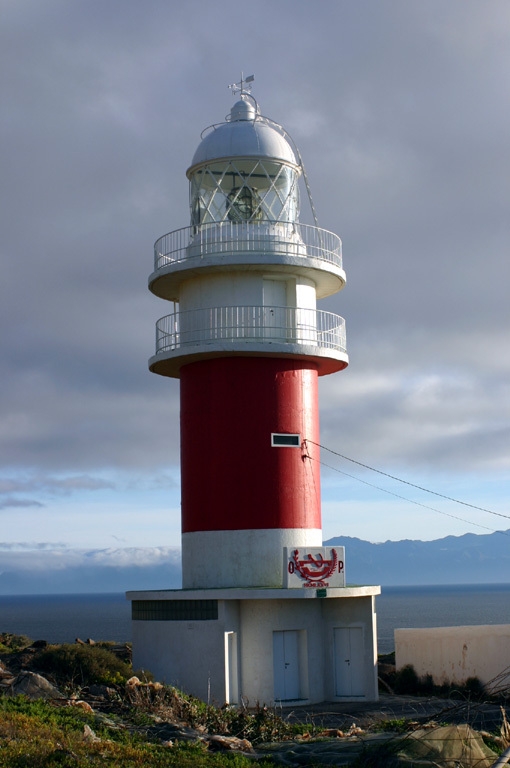 This lighthouse marks a prominent cape on the east side of the island; white flashes are shown for southbound ships and red flashes for northbound ships. Located about 4 km (2.5 mi) southeast of Telde. Site open, tower closed. ARLHS CAI-057; ES-12445; Admiralty D2807.5; NGA 23990. 1897. Inactive. 6 m (20 ft), round cylindrical stone tower with lantern attached to the front of a 1-story masonry keeper's house. Marc Ryckaert's photo is at right. This historic lighthouse was restored in the late 2000s. Pedro Afonso's 2006 photo shows it almost in ruins, with no lantern. 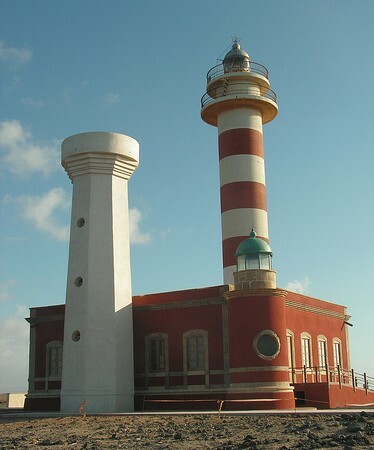 A 2008 photo by David Béjar Suárez shows the restoration in progress, and a 2011 photo shows the restored lighthouse equipped with a lantern of modern design. A restaurant opened in the building in August 2016. Site open, tower closed. Site manager: Restaurante Faro de Arinaga . ARLHS CAI-082. Date unknown (station established 1897). Inactive since 1984 and demolished in 2008. Approx. 9 m (30 ft) round concrete tower with gallery, attached to one end of the original keeper's house. 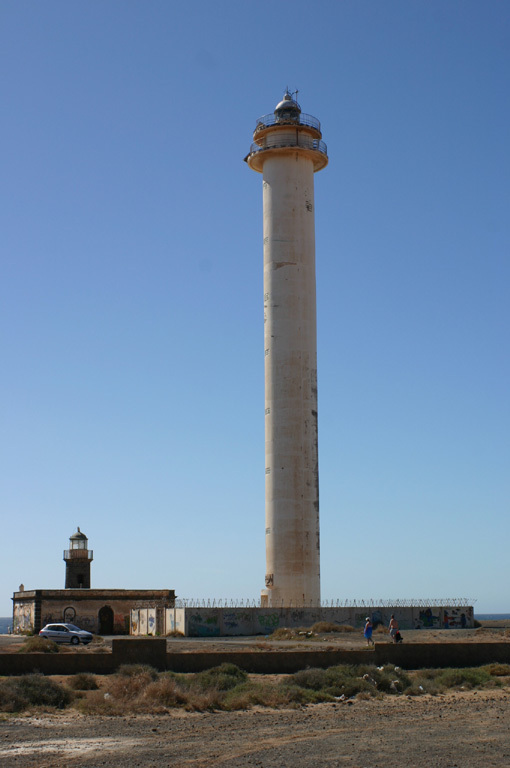 This tower, seen in a pre-restoration photo, was demolished in the restoration of the historic lighthouse; a photo by Débora León Ramírez shows the station as it now appears. Site open, tower closed. ARLHS CAI-062. 1984 (station established 1897). Active; focal plane 47 m (154 ft); three flashes every 10 s, white or red depending on direction. 14 m (46 ft) round cylindrical masonry tower with lantern and double gallery. Lighthouse painted white with horizontal red bands below the galleries. Marc Ryckaert's photo is at right, a closeup photo is available, Trabas has a photo, Wikimedia has a photo, and Google has a street view and a satellite view of the station. Located on a promontory at Playa de Arinaga, on the southeast coast of the island. Site open, tower closed. ARLHS CAI-024; ES-12510; Admiralty D2812; NGA 24008. 1890. Active; focal plane 60 m (197 ft); three white flashes, in a 1+2 pattern, every 13 s. 56 m (184 ft) round stone tower with lantern and gallery, attached to one corner of a 2-story keeper's house. The lighthouse is unpainted blue-gray stone; keeper's house painted white with unpainted stone trim. A 2008 photo by Rüdiger Marmulla is at right, an excellent closeup photo is available, Trabas also has a closeup, Wikimedia has numerous photos, Huelse has a postcard photo, and Google has a street view and a satellite view. 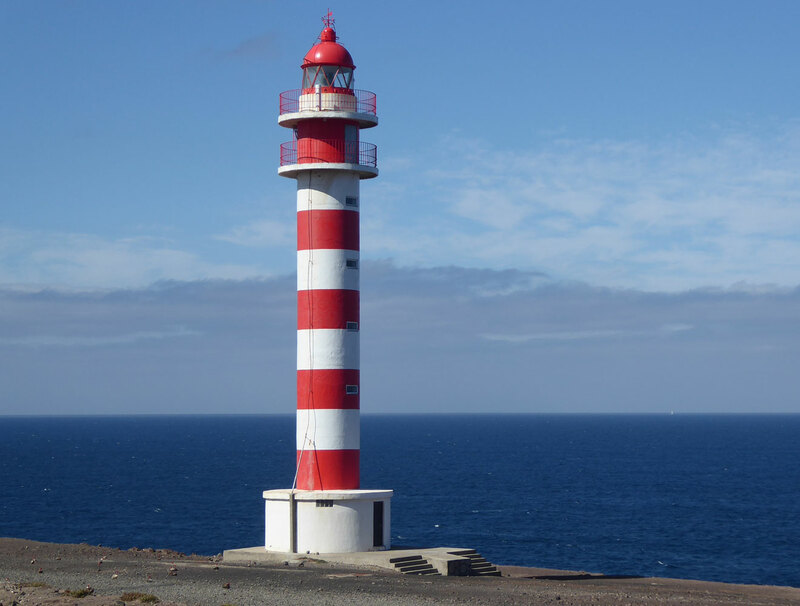 This great lighthouse marks the southern tip of the Isla de Gran Canaria and is one of the island's best known tourist attractions. The surrounding area of sand dunes interspersed with wetlands is a protected nature reserve. Located about 4 km (2.5 mi) south of the town of Maspalomas. Site open, tower closed. Site manager: Reserva Natural Especial de Las Dunas de Maspalomas. ARLHS CAI-018; ES-12520; Admiralty D2814; NGA 24012. Date unknown. Active; focal plane 11 m (36 ft); two quick red flashes every 4 s. 10 m (33 ft) post light surrounded by a square skeletal tower supporting a spiral stairway, attached to a small 2-story building. Trabas has a photo, and Google has a satellite view and a distant street view. The original light was a 4 m (13 ft) masonry tower. Located at the end of the west breakwater at a pleasure craft marina in Puerto Rico, about 25 km (15 mi) northwest of Maspalomas. Accessible by walking the pier. Site open, and there doesn't appear to be any obstacle to climbing the tower. ES-12580; Admiralty D2815.7; NGA 24022. Date unknown (modern). Active; focal plane 13 m (43 ft); three red flashes every 8.5 s. 6 m (20 ft) trapezoidal tower mounted on the flat roof of a circular 1-story restaurant. Building and tower painted white, but there are narrow red horizontal bands around the lower half of the tower, and the lantern roof is also red. Santiago Ojeda has a 2007 photo, Trabas also has a good photo, and Google has a street view and a satellite view. Located at the end of the breakwater at Puerto de Mogán, one of the few protected harbors on the southwestern coast of Gran Canaria. Site and restaurant open, tower closed. Site manager: Restaurante El Faro de Mogán. ARLHS CAI-061; ES-12600; Admiralty D2815.96; NGA 24023. 1996. 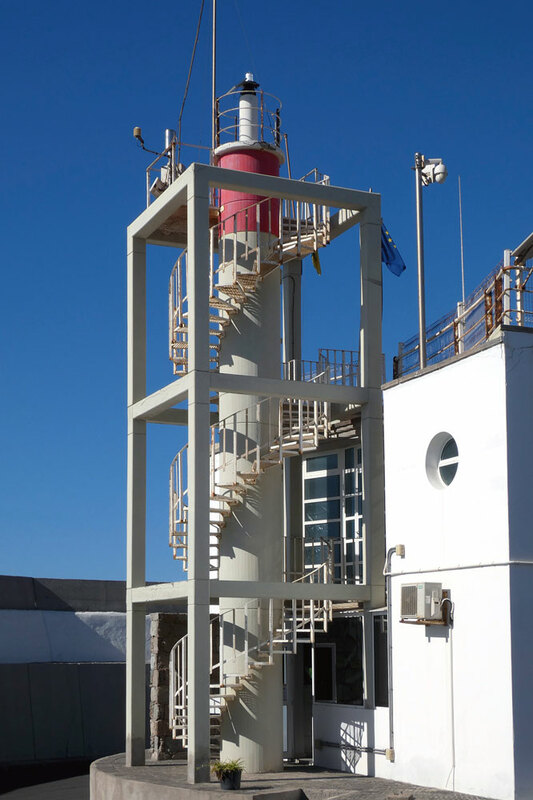 Active; focal plane 114 m (374 ft); white flash every 5 s. 21 m (69 ft) square cylindrical tower with three galleries but no lantern, mounted on a 2-story square base; access to the galleries is by an external stairway that winds around the tower. The lighthouse was painted with blue and white horizontal bands in 2014. Trabas has Werner Seiler's photo, a closeup photo is available, Wikimedia has a photo, and Google has a satellite view. 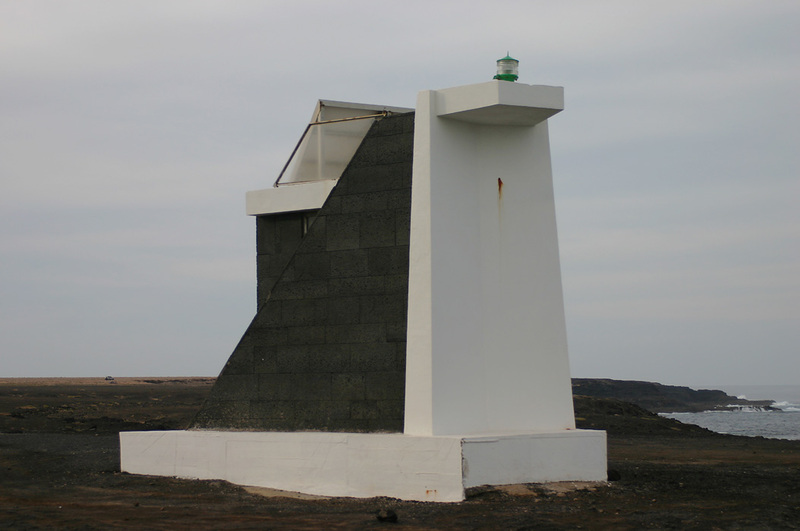 This somewhat ungainly modern lighthouse marks the southwestern corner of the island. Located atop a steep hill just northwest of Puerto de Mogán; accessible by by a stiff climb from the marina. Site open, tower closed. ARLHS CAI-006; ES-12607; Admiralty D2815.94; NGA 24023.7. Note: Fuerteventura is the Canary Island closest to the mainland of Africa, lying barely 80 km (50 mi) west northwest of Cape Juby in southern Morocco. The island is about 100 km (60 mi) long and up to 31 km (20 mi) wide. 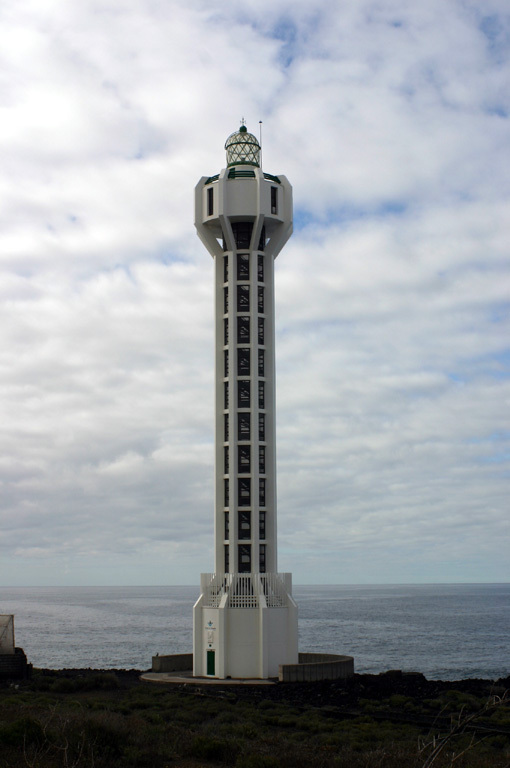 These lighthouses are operated by the Autoridad Portuaria de Las Palmas de Gran Canaria. Date unknown (station established 1864). Active; focal plane 33 m (108 ft); white flash every 4 s. 19 m (62 ft) round concrete tower with lantern and gallery, attached to a 1-story keeper's house. The lighthouse is unpainted stone; keeper's house painted white with unpainted stone trim; the lantern is all glass, even the dome. Trabas has a closeup, Guyomard and Carceller have posted a photo by Eric Valenne, another good photo is available, and Bing has a satellite view. 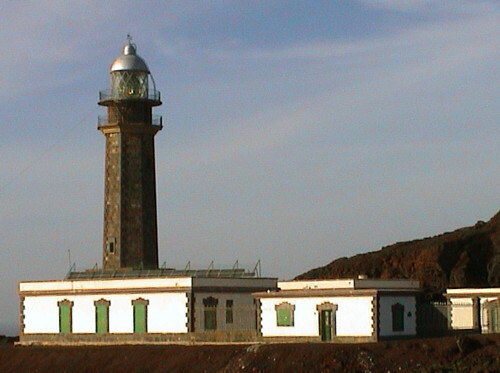 Caution: the name "Faro de Jandía" is often applied to the Morro Jable lighthouse (see below). Located at the end of a barren peninsula at the extreme southwestern tip of the island; accessible by 4WD. Site open, tower closed. ARLHS CAI-040; ES-12210; Admiralty D2790; NGA 24024. Date unknown. Active; focal plane 10 m (33 ft); white light occulting twice every 6 s. 5 m (16 ft) square equipment room with the light mounted on a bracket on the front. Trabas has a closeup, Robert Wróblewski has a street view, and Google has a satellite view. Located on the northern tip of the peninsula at the extreme southwestern end of the island; accessible by 4WD. Site open, tower closed. ARLHS CAI-067; ES-12212; Admiralty D2791; NGA 24026. 1897. Inactive since the 1950s. 7 m (23 ft) round cylindrical stone tower with lantern and gallery, attached to a 1-story masonry keeper's house. 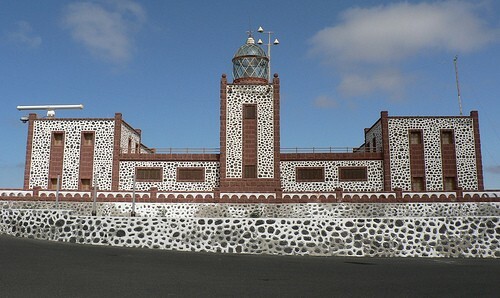 Like the Arinaga lighthouse (see above), the lighthouse has been restored, apparently in 2006. 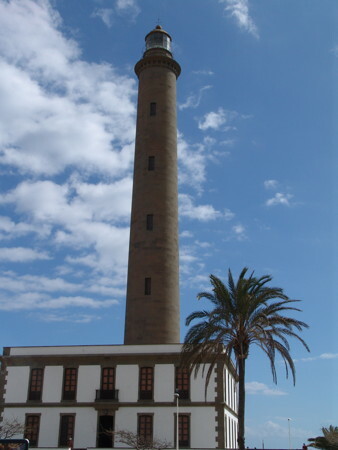 Alex Castellá's 2005 photo, Guyomard and Carceller's photos by Eric Valenne, and another photo show the old lighthouse before restoration. 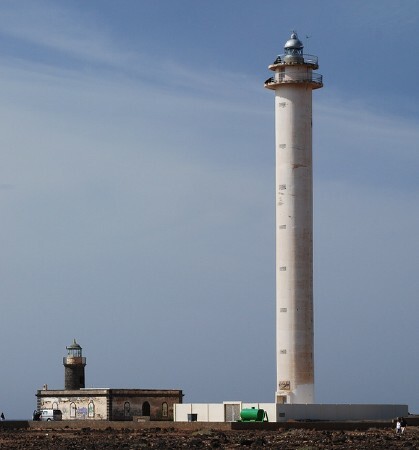 The photo at right shows the restored lighthouse, and all three Tostón light towers can also be seen in the photo posted by Trabas. The building is now occupied by the Museo de la Pesca Tradicional, a museum devoted to traditional fisheries of the islands. ARLHS CAI-088. 1950s (station established 1897). Inactive since about 1986. Approx. 15 m (49 ft) octagonal concrete tower with gallery, unpainted; lantern removed. A photo is at right. ARLHS CAI-087. 1986(?) (station established 1897). Active; focal plane 35 m (115 ft); white flash every 8 s. 30 m (98 ft) round cylindrical concrete tower with lantern and double gallery. Lighthouse painted white with horizontal red bands below the galleries; lantern dome is metallic gray. A photo is at right, another good closeup is available, Trabas has a photo, Wikimedia has Alex Castellá's 2005 photo and numerous other photos, and Google has a closeup street view and a good satellite view of the station. Located on the northwestern corner of Fuerteventura, about 4 km (2.5 mi) north of El Cotillo. Site open, tower closed. ARLHS CAI-058; ES-12220; Admiralty D2792; NGA 24040. 1865. Active; focal plane 29 m (95 ft); two white flashes every 15 s. 7 m (23 ft) square cylindrical stone tower with lantern and gallery, attached to the front of a 1-story stone keeper's house. Tower unpainted; building painted white with stone trim; lantern is metallic gray. Antonio Martos Fernández has a closeup street view, Trabas has a distant view, and Google has a satellite view. The Isla (or Islote) de Lobos is a 468 ha (1160 acre) island located off the northeastern tip of Fuerteventura. The entire island has been protected since 1982 as a nature preserve, but most of it is open to visitors. Boat transportation is available from Corralejo on the north coast of Fuerteventura. Located on the northeastern tip of the island, marking the south side of the Bocaina Channel separating Fuerteventura from Lanzarote. Site open, tower closed. Site manager: Parque Natural Islote de Lobos. ARLHS CAI-005; ES-12140; Admiralty D2786; NGA 24044. 1992. Active; focal plane 48 m (157 ft); white flash every 5 s. 43 m (141 ft) round cylindrical concrete tower with lantern and gallery, rising from a 1-story circular base. The lighthouse is unpainted white concrete; lantern dome is gray metallic. J. Manganell has a photo, Xito Iglesias has a photo, Trabas has a good closeup, and Google has a street view and a satellite view. 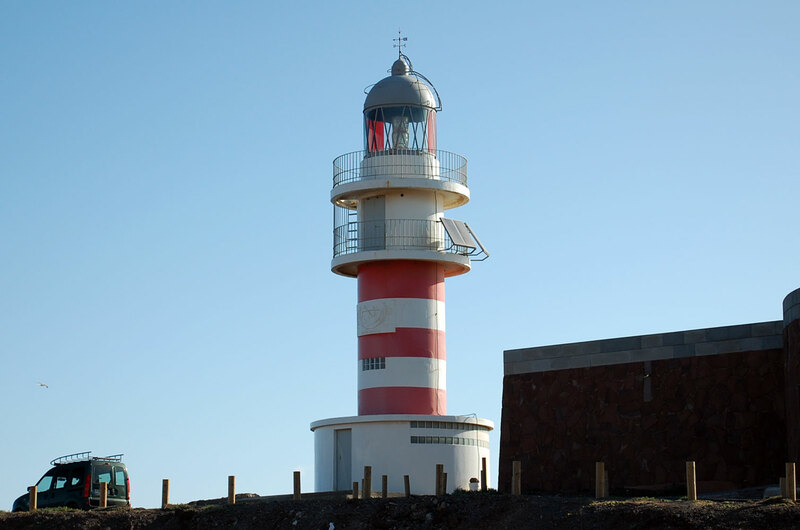 This is the landfall light for Puerto del Rosario, the principal town and port of the Isla de Fuerteventura. Located on the Punta Gaviota on the east side of Puerto del Rosario. Site open, tower closed. ARLHS CAI-064; ES-12165; Admiralty D2793.5; NGA 24034. 1954. Active; focal plane 196 m (643 ft); three white flashes, in a 2+1 pattern, every 18 s. 12 m (39 ft) square cylindrical rubblestone tower with lantern, rising from a U-shaped 1- and 2-story keeper's complex. This lighthouse has a striking appearance, being built of dark brown stones cemented together with a white mortar; the lantern is all glass, even the dome. Alistair Young's photo is at right, Trabas has a closeup photo, Guyomard and Carceller have photos by Eric Valenne, Wikimedia has numerous photos, and Google has a street view and a satellite view. Located about 6 km (3.5 mi) east of Las Playitas on the southeast coast of the island. Site open, tower closed. ARLHS CAI-041; ES-12190; Admiralty D2795; NGA 24032. Date unknown. Active; focal plane 9 m (30 ft); three red flashes every 7 s. 7 m (23 ft) round barbell-shaped tower. Entire lighthouse is red. Trabas has a photo, and Google has a street view and a satellite view. Located on the west breakwater of Puerto de Gran Tarajal, on the south coast of the island. Accessible by walking the pier. Site open, tower closed. ARLHS CAI-017; ES-12197; Admiralty D2796.1; NGA 24033. 1991. Active; focal plane 62 m (203 ft); two white flashes every 10 s. 59 m (194 ft) round white concrete (?) tower with lantern and gallery; a 2-story "watch room" section under the gallery is entirely enclosed by windows. Lighthouse is white; the lantern dome is glass. 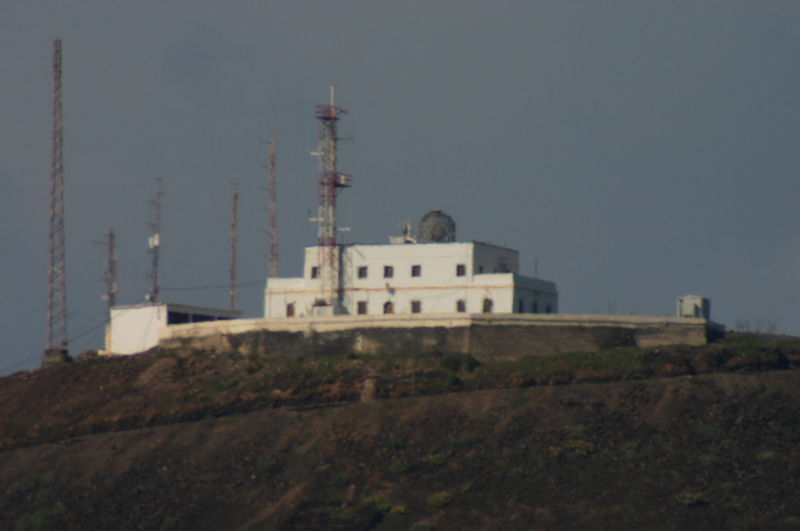 A 2007 closeup is available, Trabas has a photo of the lighthouse in action, Guyomard and Carceller have fine photos by Eric Valenne, Wikimedia has several photos, and Google has a street view and a satellite view. Morro Jable is a popular resort town at the southernmost point of the island. Located on the beach, near the resorts. Accessible by road. Site open, tower status unknown. ARLHS CAI-016; ES-12198; Admiralty D2796.5; NGA 24027. Note: Lanzarote, at the northeastern corner of the Canary Islands, is about 60 km (38 mi) long and up to 25 km (15 mi) wide. 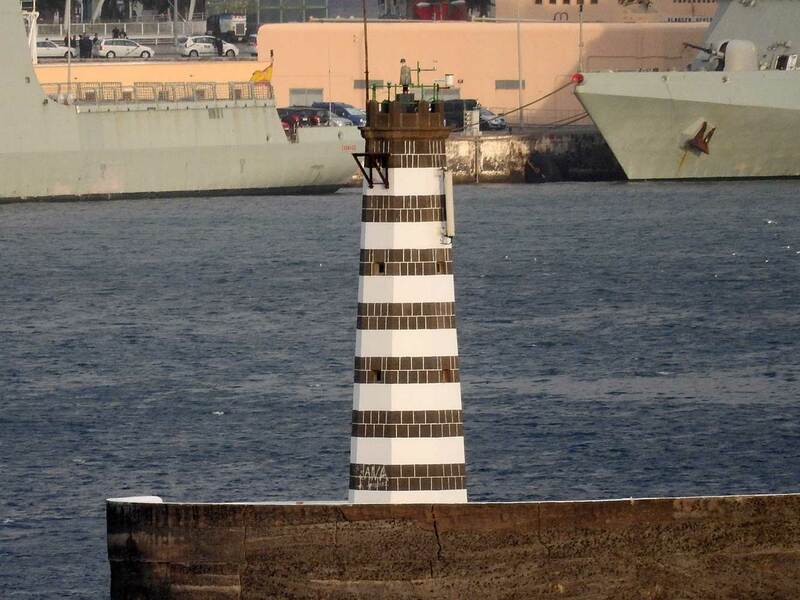 These lighthouses are operated by the Autoridad Portuaria de Las Palmas de Gran Canaria. 1866. Inactive since 1988. Approx. 10 m (33 ft) round cylindrical stone tower with lantern and gallery, attached to the front of a 1-story stone keeper's house. Tower unpainted; lantern dome is metallic gray. 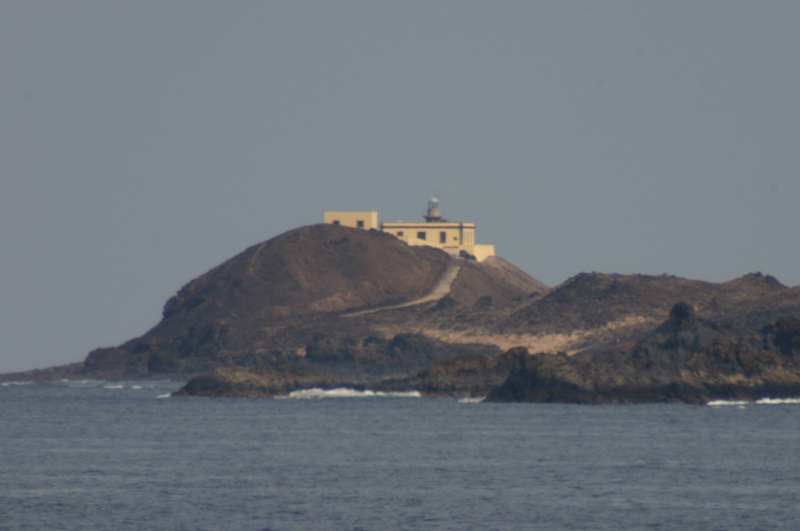 The lighthouse appears in the photo at right, Andrés Medina has a photo, and Agustín Ostolaza has a photo. The building is sealed and appears to be abandoned. ARLHS CAI-069. 1988 (station established 1866). Active; focal plane 55 m (180 ft); three white flashes every 30 s. 50 m (164 ft) round cylindrical concrete tower with lantern and double gallery. Entire lighthouse painted white; lantern dome is metallic gray. José Manuel's photo is at right, Guyomard and Carceller have photos, Trabas has a good photo of the station, Paul Whieldon has a street view, and Google has a satellite view of the station. 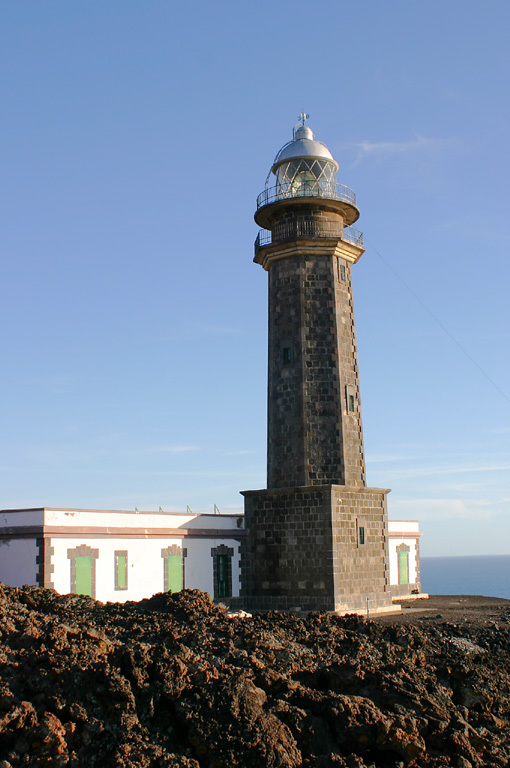 This lighthouse stands on the southwesternmost point of Lanzarote, marking the north side of the Bocaina Channel separating Fuerteventura from Lanzarote. Located about 4 km (2.5 mi) west of Baja Montaña. Site open, tower closed. ARLHS CAI-047; ES-12129; Admiralty D2782; NGA 24048. 1865. Active; focal plane 17 m (56 ft); white flash every 3 s. 15 m (49 ft) round stone tower with lantern and gallery, rising through the front of a 1-story masonry keeper's house. The tower is unpainted gray stone; lantern dome is gray metallic; house painted white with unpainted trim. Violeta Sánchez has a photo, Mash Qimanfaya has a photo, and Google has a satellite view. 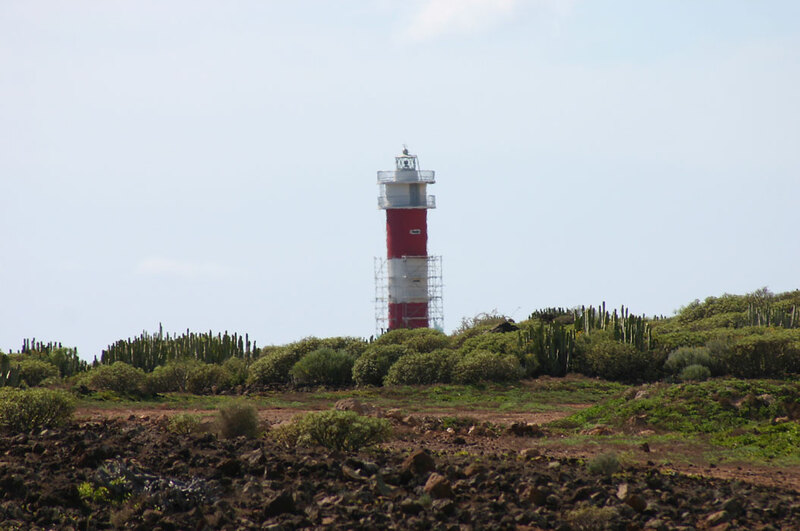 In 2014 the Las Palmas port authority and the government of Lanzarote agreed to share funding for a restoration of this historic lighthouse and Qimanfaya's photo seems to show the results of these improvements. The Isla de Alegranza is the northernmost land of the Canary Islands, located about 25 km (15 mi) north of Lanzarote. Most of the island is occupied by the caldera of a dormant volcano. Boat transportation to Alegranza is available from Órzola at the northern end of Lanzarote. Lighthouse located at the northeastern point of the island. Site open, tower closed. Site manager: Parque Natural de Archipiélago Chinijo. ARLHS CAI-034; ES-12000; Admiralty D2772; NGA 24076. Posted January 15, 2006. Checked and revised December 14, 2018. Lighthouses: 49. Site copyright 2018 Russ Rowlett and the University of North Carolina at Chapel Hill.